Our workstations have a classic appearance that reflects a time predating the invention of electricity. They are designed to mix with traditional design, but will also be comfortable in eclectic motifs that blend traditional and contemporary design. Each piece is freestanding, with its sides and sometimes backs totally finished and exposed. Because they do not attach to other pieces, the heights and depths of the units can vary, resulting in new performance opportunities that simply aren’t prevalent in today’s kitchens. For example, by incorporating deeper counter tops and deeper drawers and storage areas in the “reach zone”, each piece is more efficient per lineal foot than typical in-line cabinetry. Expensive countertop materials are used more efficiently for functional areas that require high performance, leaving lower cost materials available for less demanding areas, again a feature difficult to achieve successfully in traditional cabinetry. The U.L. Listing signifies that our workstations that enclose built-in appliances with heating functions have been tested to meet U.L.’s published Standards of Safety. Due to our unique U.L. Listed technology, YesterTec is the only company in the world capable of creating workstations that conceal standard appliances so effectively. The line incorporates a broad range of models, sizes, design options, material and color selections that allow designers great design flexibility, allowing pieces to fit into most new or renovated kitchen situations. State of the art, durable construction and finishing techniques are used to ensure lifetime value and heirloom quality in each piece. Durable, natural materials such as wood, granite and soapstone are used to create beautiful pieces that will age gracefully over time. Each piece has its own brass identification plaque that is sequentially numbered to enhance the line’s ability to become collectable. No two workstations will have the same number. And for those who wish to purchase a “collection” of YesterTec pieces in phases, our database can track all previous purchases, so that the new pieces can blend with the existing ones. Workstations are designed by selecting from our enormous selection of pre-designed and pre-priced components that are illustrated in our catalog. Pre-design facilitates the selection process and speeds up the order-delivery time line. Customers can chose appropriate pieces to fit into their future kitchen, view a 3-D rendering of the design via our custom computer program, select all desired options for each unit and obtain a price quote all within a single design session. In addition, we will accommodate custom design requests that fall within the scope of our manufacturing and design parameters. Pre-design also eliminates the learning curve required for typical custom production. This translates into higher quality, cost efficient products as well as faster delivery. Our products are available to the homeowner, designer or installer who is responsible for the project. Units are delivered anywhere in the USA and Canada. 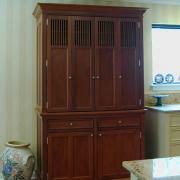 Installation of the product is simple compared to conventional, inline cabinetry. 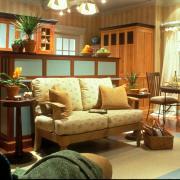 Units are delivered to the site, assembled (if required) and then leveled and fastened to the walls or floor. Most units are shipped as one or two pieces, but can be disassembled for accessibility constraints. The largest units are shipped “broken down” and and can be assembled using simple proceedures. Procedures that are eliminated are: Leveling and fastening together entire lines of cabinets, custom ordering and fitting countertops to exact room dimensions, cutting sink and cooktop cutouts, installing filler strips and back splashes. The durability and timeless character of the workstations enhance their ability to endure years of hard use and weather a multitude of design trends. In addition, to accommodate the lifestyle of our mobile society, YesterTec Workstations can be moved when their owners move to a new home, further enhancing their purchase as a lifetime investment. 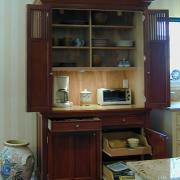 So think about making a your kitchen a YesterTec Kitchen! In order to produce the most appropriate design, we feel that it is important to become completely familiar with our full line of products prior to ordering them. A visit to our showroom is obviously the best way to discover all the subtle differences between YesterTec Kitchens and all others. But for those who are unable to visit our showroom, we have taken special care to illustrate as much as possible about our products and design services in our PDF designer’s catalog. Please call us if you would like to visit the Kitchen Works showroom or if you have any other questions concerning this exciting new concept in kitchen design.